Last month while wandering through the aisles of Target, I was drawn to the peach colored packaging of Shea Moisture in the Coconut Hibiscus scent. Unfamiliar with this line of natural and organic products, I took some time and read the labels and looked over the rest of their products. I was impressed not only by the product ingredients, but also by the philosophy and history of the company. You can read their uplifting story here and learn how their "humble beginning" has grown not only into a successful business that is both Eco and socially conscious, but also into an organization that believes in giving back and helping others achieve success. They offer a wide range of face, hair and body care products in a variety of scents, that are made with certified natural and organic ingredients. A 30 day money back guarantee is offered on all of them, and their products are cruelty-free. Target carries an assortment of their products, while Walgreens is now offering their hair care line. You can also purchase the entire line on Shea Moisture's web site. I found all three of the products I purchased to be of superior quality. The Body Wash lathers up nicely, rinses clean, and best of all, I don't feel the need to use a moisturizer once I'm out of the shower. A bonus is that your bathroom will smell like a tropical getaway! The Lotion is fairly thick, but it absorbs well without a greasy feeling. You're left with soft, supple skin and a light fresh scent. This works well as both a body and hand moisturizer. The Pure Shea is a versatile product. I've been using it on my cuticles, my toes and heels, elbows, lips...anywhere that needs long-lasting additional moisture. I even use it on my eye brows in place of brow gel, and it soothed a cat scratch as well! What I like about this particular scent is that it's not too floral and sweet, and the coconut isn't overpowering either. This scent combination evokes many memories of summers spent lying on the beach here at home, or long ago Spring Breaks in Florida. Organic Coconut Hibiscus Shea Butter Body Wash-$9.99/13 oz. Organic Coconut Hibiscus 100% Shea Butter-$9.99/4 oz. Organic Coconut Hibiscus Shea Butter Lotion-$9.99/13 oz. Shea Moisture products do not contain any of the following ingredients: Parabens, Phthaltes, Paraffin, Formaldehyde, Propylene Glycol, Mineral Oil, Synthetic Fragrance, PABA, Synthetic Color, DEA, Animal Ingredients. All ingredients are ethically traded, sustainably produced, and free of animal testing. Their conditioner is amazing as well! I've only tried the Coconut and Hibiscus one but it works fantastic on my thick and wavy hair. I can't wait to try more of their products. Hey Mary! I saw your comment on G's blog about the Coconut Hibiscus scent and I was hoping you were going to review them on your blog! I really want to try these now! Thanks so much! These sound so yummy, but the labels need a serious makeover! Gosh I love Target! I always find the best hidden gems there. It's where I found out about Yes to Carrots and Sonia Kashuk! 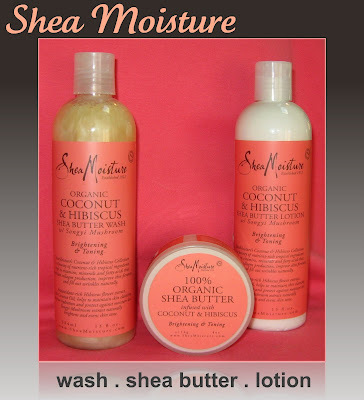 ...More importantly, the Shea Moisture shea butter lotion is so amazing! BIG fan of their stuff! This sounds like a great brand. Shea butter is so very moisturizing. Love the stuff. Just found out these body products are now offered at Walgreens. Thanks to your review I'll be trying them!